Different strokes: Els at the Cadillac Championship earlier this month. All-round athletes with experience of other sports, who can bring physical power and balance to their technique, are the future of golf, South African Ernie Els said on Tuesday. “Now the guys are athletic, they look after themselves, they are hitting it over 300 yards and they can keep control of the golf ball. I think that’s the future," said three times major champion and former world No. 1 Els. The number of out-of-shape or oversized players on the PGA Tour, such as John Daly and Mark Calcavecchia, has declined over the past 15 years, with Tiger Woods’ toned physique setting the standard in many ways. 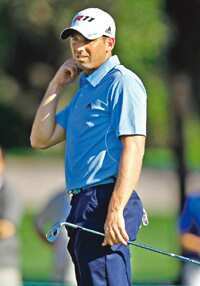 “I think Gary Woodland is a product of what has been happening over the past 10 years or so. I think Tiger had a big say in that. People looked at him and thought ‘I want to look like that’," said Els. “(Australian golfer) Adam Scott was staying with me last week and we played tennis and I couldn’t believe how good a tennis player he is. He surfs as well," added Els, who also pointed out that Spanish golfers Alvaro Quiros and Sergio Garcia are keen amateur soccer players. Another high: Garcia is an amateur soccer player. Even then, he took a basketball scholarship at Washburn University in Kansas for a year before he switched to golf at the University of Kansas. Woodland said that despite his late switch he did not feel a significant disadvantage playing against golfers who had been focused on one sport from an early age. “I am behind in the experience factor of this game but I don’t think I’m behind at all in the competition part of it. On Sunday, when it’s competition, that is what I want. I’ve grown up in competition my whole life," said Woodland. Els believes that in addition to having a strong competitive spirit, golfers such as Woodland can have a physical edge because their bodies have not developed mainly through golfing drills. “I think if you are a natural sportsman and you’ve played baseball or hockey or tennis or even football for that matter, it gets your body moving in different ways, not just in a golf, repetitive way," said Els. “Those kinds of players have a longer life span in the game. If you look at Jack Nicklaus, he played other sports, Arnold Palmer played other sports. “It really helps, especially with the technology today. The quicker you can swing that club, the further you are going to hit it and the new technology gives you more control over the ball," he added.